When you need a holiday. Before you start checking to see if your passport is up to date, what about considering a holiday here in WA. A suggestion might be a three or four day drive down the Great Southern Highway. Nowadays the highway is becoming known as Heritage Highway 120. One of the amazing features of Heritage Highway 120 is the availability of adventure activities. Skydiving, gliding and a range of motor sports plus a number of sports including football hockey and horse racing. If all or some of these are on your bucket list, then what are you waiting for? Great Southern Highway is a highway that commences from its intersection with Great Eastern Highway at The Lakes, 50 km from Perth, and ending at Albany Highway near Cranbrook. It is the primary thoroughfare for this part of Western Australia and runs parallel with the Perth-Albany railway for its entire length. It is signed as State Route 120 from York to Cranbrook, and was first named in 1949, although was built well before that time. The highway initially travels east to the historic town of York, before following the Avon Valley and the railway roughly southwards through Beverley until Narrogin. 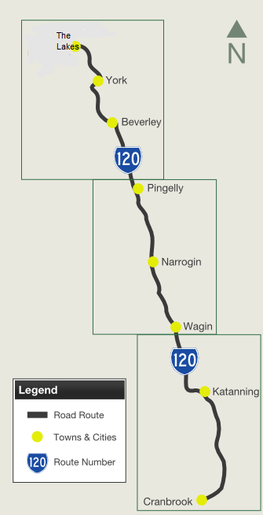 The highway then runs parallel with Albany Highway at a distance of about 30 kilometers through Wagin and Katanning before curving to approach Albany Highway where it ends 4 km past Cranbrook. Many of the towns along this highway have prominent grain silos, and Narrogin, Wagin and Katanning have remained important population centres sustained by agriculture and its supporting industries. All of these towns have a significant number of heritage buildings. The Town of Beverley in particular is most picturesque and its heritage buildings will enthral photographers. If you have never driven down the Great Southern Highway then you should plan your trip now.